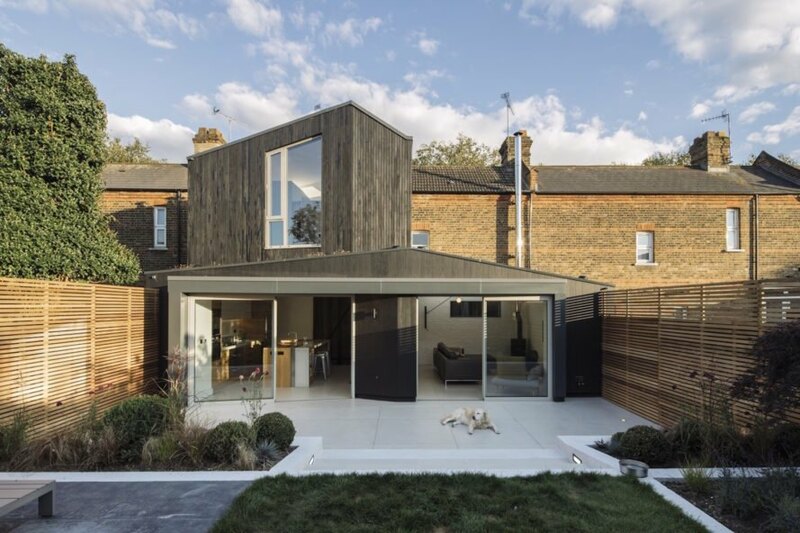 To embrace indoor/outdoor living, this Victoria-era house in London is outfitted with a handsome new extension wrapped in Shou Sugi Ban cladding. 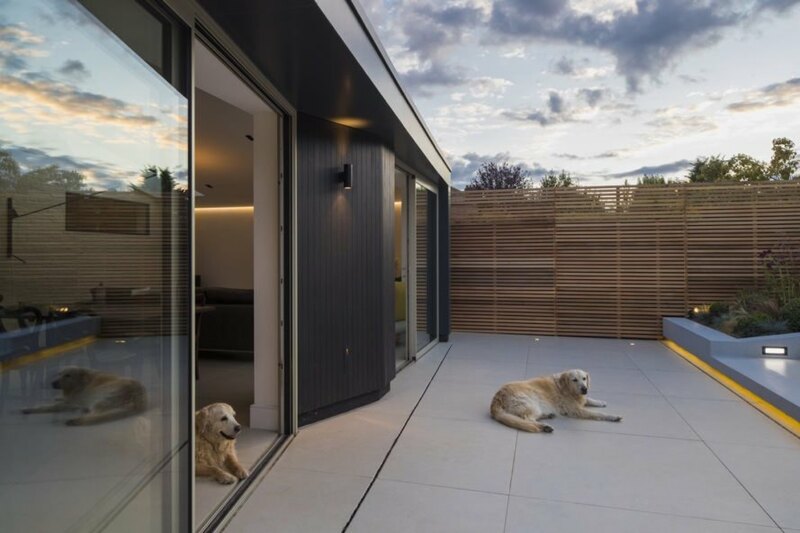 Designed by Neil Dusheiko Architects, the Black Ridge House provides a modern contrast to the original home’s Victorian brickwork. Inspired by biophilic design principles, the new-build was constructed with several energy-saving features — such as a green roof and underfloor heating — and sustainably sourced timbers to connect the home to nature. Inspired by the rooflines of the area’s early Warner houses, the Black Ridge House features gabled volumes clad in Kebony, a sustainable and durable alternative to tropical hardwood. 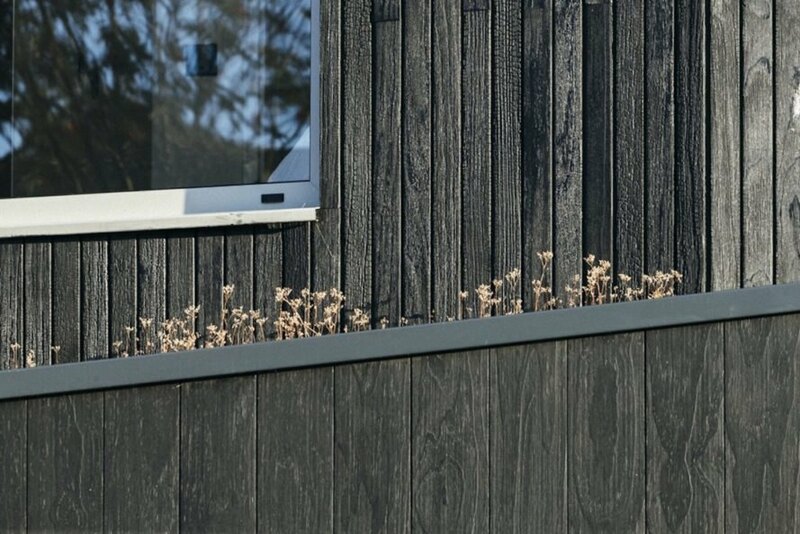 The engineered wood was charred using the Shou Sugi Ban technique to create a beautifully blackened finish that’s also weatherproof. 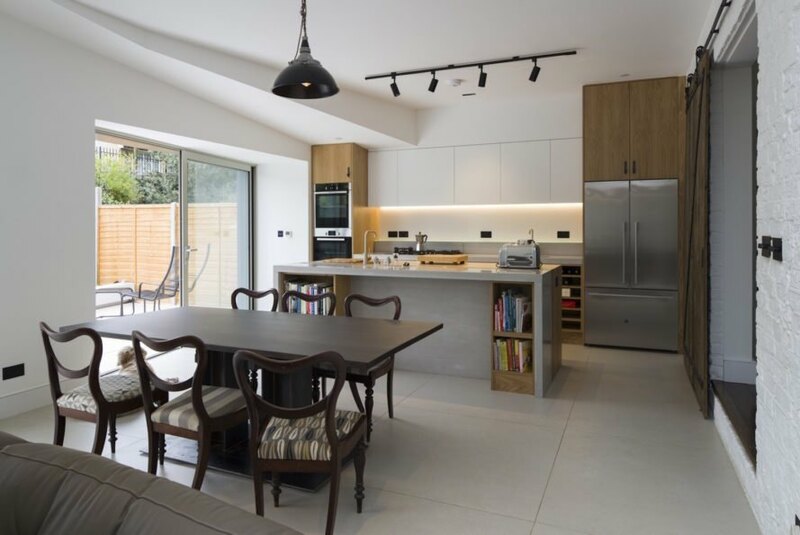 The extension includes an open-plan kitchen, dining room and living area on the ground floor, while a new master bedroom and skylit bathroom are located on the upper floor. The building opens up to the garden through large double-glazed metal windows. 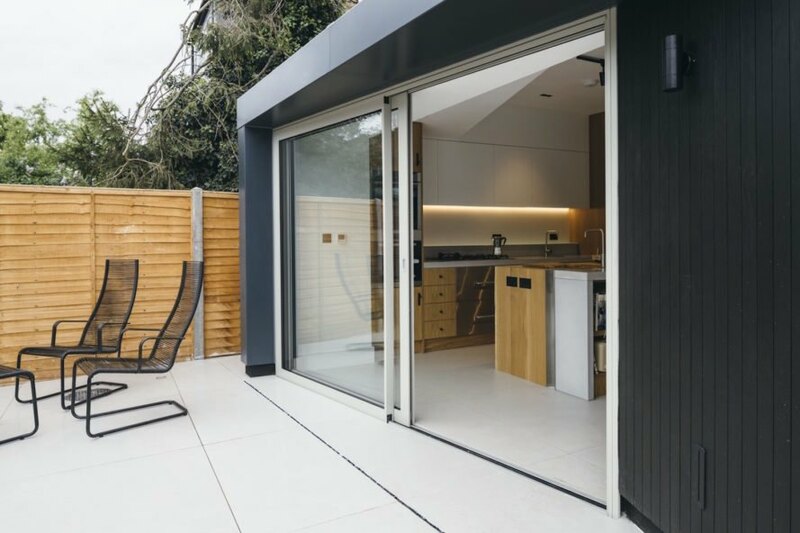 Airtight detailing, underfloor heating, ample access to natural light and an insulating green roof keep energy demands to a minimum. 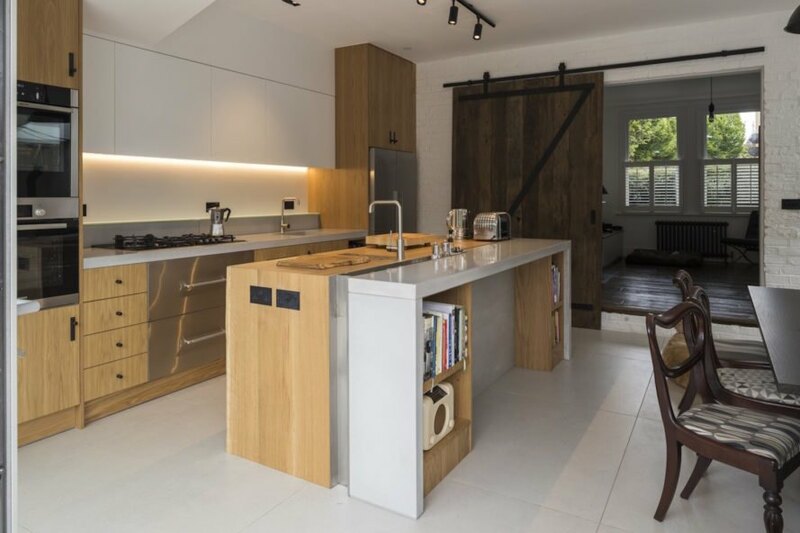 From the sliding door made with reclaimed timber panels to the oak worktop and cupboard doors, the light-filled interior utilizes natural materials. This Victorian home gets an update with a biophilic-inspired extension. The extension's locally-sourced charred timber facade contrasts with the home's original brickwork. 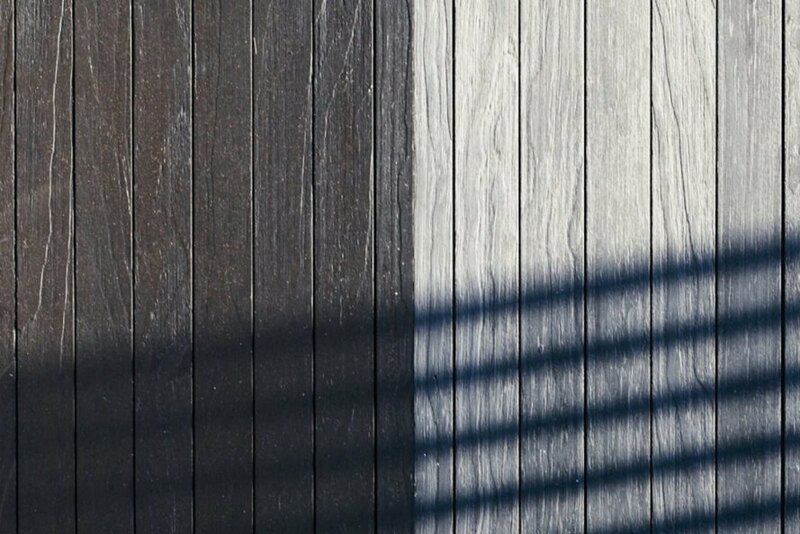 The new addition is clad in Shou Sugi Ban Kebony, which is sustainable and weatherproof. Large glass doors let in plenty of natural light. The open floor plan makes gives residents plenty of living space. The large doors also help connect the interior with the outside. The architects included many sustainable features, including a green roof. The home features natural building materials throughout, including oak counter tops and cabinets. The ground floor of the new build has a skylight to provide more light during the day. The house is inspired by biophilia.